We’ve discovered something that we just adore – recylced skateboard jewellery by O’Blue. Each piece of jewellery is handcrafted from old skate decks and since no two used boards are ever the same – every piece of jewellery is stunningly unique. The skateboards (and therefore the jewellery) are made from tasty 7 ply Canadian maple and have either a coloured, printed or stained outer layer. Each piece is lovingly handcrafted and finished with beeswax which brings out the natural grain and colour of the wood. This really is jewellery at it’s coolest, most ethical and most eco-friendly. The designer of these little gems is Nat Rigby and she has kindly offered up two amazing prizes. Good Luck. Keep reading for a little interview we did with Nat. How did you get into making skateboard jewellery? I started making jewellery about three years ago, I started recycling toys into jewellery – dolls house miniatures, Barbie shoes, anything I could get my hands on, this morphed into the recycling ethic that runs through my work. I have recycled fabric, tape measures, vinyl records, plates and crockery, cutlery and now skateboards and wheels. Me and my husband have always been skaters ever since the second wave of popularity in the early 80’s. We’ve always collected our skateboards and treasured them, even the trashed and broken bits. We’d mount them on the walls, and even made a front gate for our house out of them. 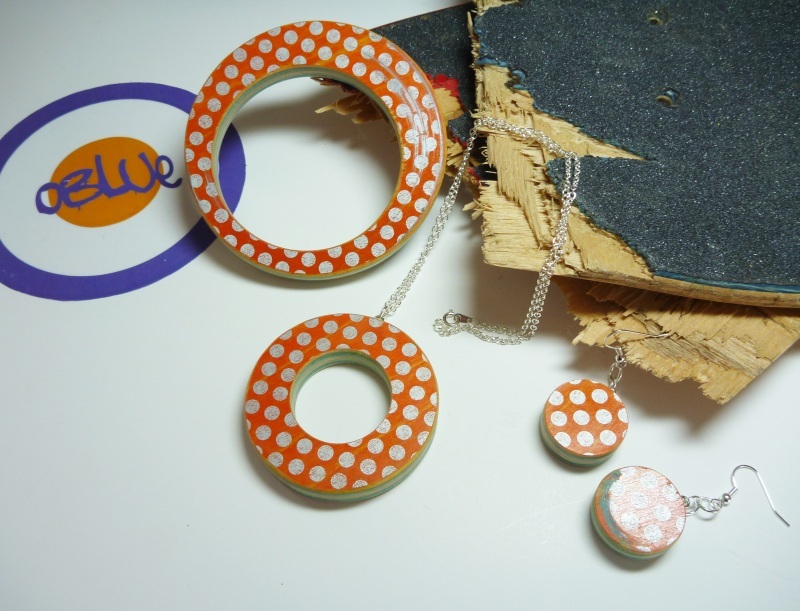 Then it occurred to me as I was already making upcycled jewellery what beautiful pieces each skateboard deck could make, and if other skaters were like us, it was a wonderful way to keep and show off your beloved trashed board. I’m very inspired by popular culture and obviously art as I’m always surrounded by it. I’m also very inspired by graffiti, guerilla art and the DIY ethic of the punk movement. I think this shows in my jewellery. I am inspired by the things that people throw away, and like to take things that have come to the end of their life and re-create them into something with purpose. When it comes to skateboards, they have a long life and are thrashed, with love, and then put to one side. I like the fact that I can recycle them into something that a skater can wear or keep for years to come. What new things have you got planned? I’m currently working on a ‘pro series’ of skate jewellery which will be made out of the decks I can get off any pro skaters. I’ve just started and have just cajoled Matt Pritchard into giving me some of his thrashed Death boards. I’m desperate to get some more so any help would be appreciated! – I’m addicted to twitter! Nat is currently stocking up her shop ready for christmas and has just started making dogtags, keyrings and man-dants for the boys because she felt she was neglecting them! Show some love and go buy yourself or someone else a unique bit of skateboard jewellery. how about a guitar using old skate deck wood? wickid!! When I was at Uni’ I used old decks as shelves. Fairly easy to get level, just two shelf brackets and pop the deck on top. If you have old trucks and wheels leave them on and even if the brackets are at an angle it looks like its flying through the air. The grip tape helps to keep stuff from falling off. My favourite one was above my bed with my alarm clock on it. You could make Christmas decorations. I really love wooden decorations at Christmas. You would be able to make quite a few from one used deck. a coffee table if you had a few decks !! actually i use my old decks as shelves. but a house would be pretty cool! i always wanted a rocking horse, guess it’d have to be quite small though? !